While many in the scientific community lauded the Supreme Court’s ruling that naturally occurring human genes may not be patented, several geneticists at Harvard Medical School on Friday said they believe the decision warrants a more lukewarm response. In a unanimous decision Thursday, the court ruled that Myriad Genetics, Inc., a Salt Lake City-based company that patented genes associated with increased risk for breast and ovarian cancer, does not have exclusive rights to offer genetic testing services for the sequences it had located. The court affirmed patenting of laboratory-engineered complementary DNA, or cDNA, but ruled that identifying a gene is not an act of invention. The ruling said that “groundbreaking, innovative, or even brilliant discovery” of DNA, as in the Myriad case, is not enough for a patent, prompting many scientists to predict that the strike down of some gene patents would open the door to a flowering of research efforts and more affordable genetic testing. 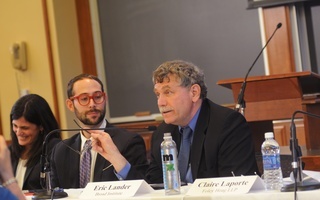 George M. Church, a genetics professor at the Medical School, agreed, saying that the decision only rules out an old style of patenting in biotechnology. Still, Raju S. Kucherlapati, a genetics professor at the Medical School, said he expects the ruling to shift routine practice within the biotechnology industry. “It will have a significant impact on molecular diagnostics,” Kucherlapati said, noting that several companies have already announced plans to offer genetic testing for BRCA1 and BRCA2, the two genes previously patented by Myriad. “This should increase competition and reduce the price of DNA-based diagnostics,” he added. Though Myriad saw its stocks rise and then plummet following the Supreme Court’s decision, Church predicted that the ruling itself would not hurt the company. Thursday’s ruling marks the second time the gene BRCA1 has been highlighted in the media in the past month. After testing positive for a mutated BRCA1, actress Angelina Jolie made headlines when she revealed in a New York Times op-ed that she had undergone a preventative double mastectomy to reduce her risk of breast cancer. —Staff writer Fatima Mirza can be reached at fmirza@college.harvard.edu. Follow her on Twitter @fatimanmirza.